Sir William Osler, a Canadian physician, once quoted "As is our pathology, so is our practice." Although it is virtually impossible to know all the oral lesions and conditions, a fundamental knowledge of oral pathology is essential to become a successful dental clinician (DC). Most dental physicians do not have a problem in diagnosing caries or periodontitis, the two most common lesions of the oral cavity. Diagnosis determines the treatment and sometimes if we fail to distinguish between reversible and irreversible pulpitis, or a benign and a malignant neoplasm, the choice of treatment becomes critical. In spite of comprehensive oral pathology syllabus in III year Bachelor of Dental Surgery (BDS) course, the DC is often flummoxed trying to diagnose common and not-so-common lesions of the oral cavity. Though there is a lot of emphasis on histopathology during undergraduate days, preliminary diagnosis in general dental practice is based on comprehensive and methodical history taking and astute observation of clinical features. Only occasionally that a clinician requires confirmation of the diagnosis by means of biopsy or other methods. The clinician should never give a diagnosis based on intuition or guesswork. How does one arrive at a diagnosis? 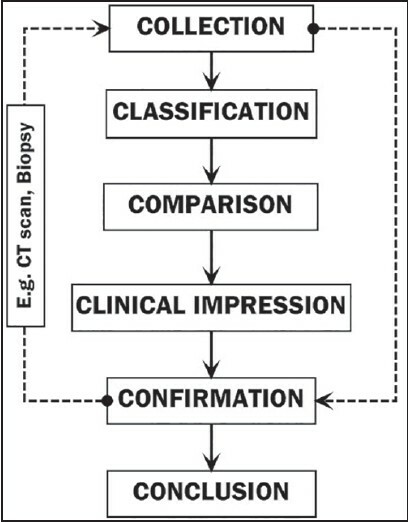 There are certain logical steps to reach the right diagnosis, and these steps are shown in [Figure 1]. If you do not ask the right questions, you do not get the right answers. A question asked in the right way often points to its own answer. Asking questions is the A-B-C of diagnosis. Only the inquiring mind solves problems. Though diagnosis might appear to be self-evident by inspection alone, co-existing diseases may undergo undetected and untreated. Nevertheless, a good history taking also ensures a good doctor-patient relationship and many a time saves the need for expensive laboratory procedures. Most lesions of the oral cavity can be categorized into any of the following [Figure 2]: change of color (white, red, blue, pigmented or combination of these); loss of integrity of the mucous membrane (erosion, fissure, or ulcer, which could be primary or secondary); growth or swelling. Lesions may involve the tooth and/or bone, either alone or in combination with other soft tissue lesions (in the oral cavity or elsewhere), or the condition could be part of a syndrome. When a dentist encounters an oral lesion, he/she should first try to fit the lesion according to any of these categories. Once the lesion has been pigeonholed, the next step is comparison. "The Sign of Four," Chapter 1: "The Science of Deduction"
How do we go about mastering this art of differential diagnosis? [Figure 3] gives an approach to several aspects of differential diagnosis. The size of the lesion, whether they are single or multiple, or whether well-circumscribed or not, give an indication of the nature of the disease, when correlated with the patient's history. The clinical appearance can give a clue to the nature of the lesions - a macule can never be misdiagnosed as a papilloma! Similarly, some sites are common for certain types of lesions- for, e.g., a pyogenic granuloma is usually seen on the gingiva and unlikely to be seen on the floor of the mouth; by the same token, a ranula (a type of mucocele) is mostly likely to occur on the floor of the mouth and is not seen on the gingiva. A comprehensive evaluation of the possible etiology of the condition while taking history may sometimes give a clue to the diagnosis. This is especially true with hereditary disorders and developmental lesions. Palpation of the lesions can give an indication of the nature of the lesions- for example, whether it is cystic or neoplastic. The color of the lesion, especially mucosal, is very useful for differential diagnosis. A homogenous white lesion is most likely to be leukoplakia, particularly in a person with tobacco consuming habit. A pigmented lesion in the gingiva adjacent to a tooth with faulty Class II amalgam restoration could be an amalgam tattoo. However, one should never look at the color of the lesion in isolation. For example: Is it a white patch, or a red papule, or a brown macule, or a pink nodule? Intrabony lesions require radiographs for differential diagnosis- whether they are radiolucent (for, e.g., ameloblastoma, keratocyst), radiopaque (for, e.g., osteoma, odontoma) or mixed (for, e.g., Pindborg tumor, Gorlin cyst). Some lesions have a typical radiographic characteristic which give an indication of the diagnosis. For, e.g., cotton wool appearance of Paget disease, moth-eaten feature of osteomyelitis, sun-ray manifestation of osteosarcoma, and ground glass appearance of fibrous dysplasia. However, the dental physician should never give a diagnosis based solely on the radiographic appearance. For e.g., cotton wool appearance is not restricted to Paget disease and can be seen in condensing osteitis. Similarly, onion peel appearance of periosteal bone (due to neoperiosteitis) is seen in osteosarcoma, infantile cortical hypersostosis, Ewing sarcoma, Garré osteomyelitis and other conditions. Based on all presenting features, that is, history, age, gender, clinical characteristics (appearance, site, location, signs and symptoms), radiological appearance (where applicable), and possible causes, the clinician should correlate all these with each other before venturing to give an opinion. If one methodically adheres to the steps of differential diagnosis, the final diagnosis is usually quite obvious. A white line on the buccal mucosa along the occlusal level is unmistakably linea alba and does not require any further investigations, or for that matter, treatment. Similarly, the clinical diagnosis of leukoedema, a bilateral white lesion of the cheeks that disappears on stretching the buccal mucosa, does not offer any difficulty in diagnosis. However, diagnosis is not always that simple. For example, if a dental surgeon encounters a white lesion or a gingival growth in the patient's mouth, how should he go about the determining the diagnosis? 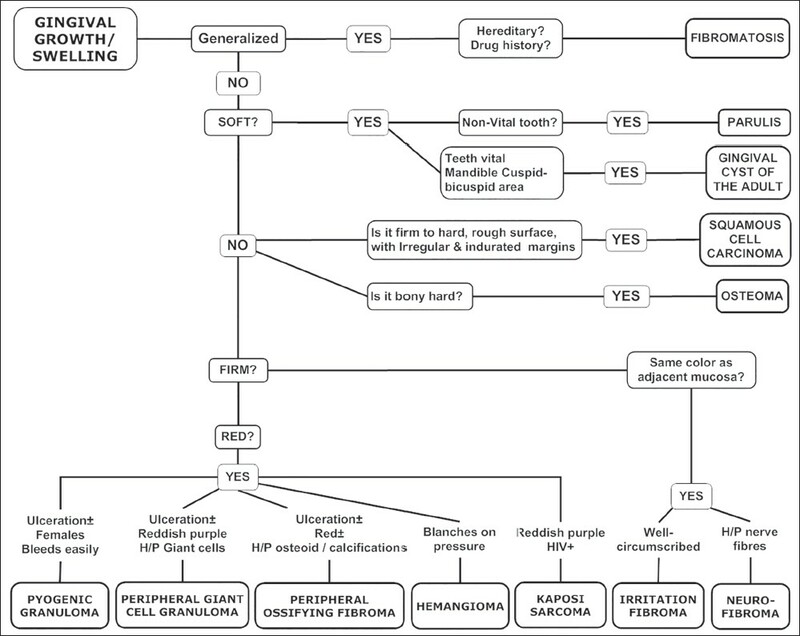 [Figure 4] gives a logical approach to a white lesion of the oral mucosa and [Figure 5] diagnostic methodology for a gingival growth or swelling. When one methodically approaches the patient with an oral lesion, the clinical diagnosis is, usually, not difficult and does not require any further investigations. However, there are certain lesions, even if we are sure of the diagnosis clinically, we require confirmation using other methods. Sometimes we need to take radiographs like intra oral periapical, orthopantomogram, or computed tomography scan etc., or do certain laboratory investigations (like HIV testing, serum Ca and alkaline phosphatase levels, hemoglobin estimation) or perform exfoliative cytology and/or biopsy. Indications and contraindications of biopsy and cytology and their surgical procedures are beyond the scope of this paper. However, the DC can perform a simple procedure like punch biopsy on his own. [Table 1] lists lesions most suitable for biopsy in general dental practice. The container should be tightly sealed and properly labeled with patient's name, age, gender and site. If biopsy has been taken from multiple sites, separate bottles must be used indicating the site (especially right or left sides). The specimen should be sent to an oral pathologist, along with appropriate documentation, at the earliest. Nevertheless, the DC is advised to refer the patient to an oral surgeon if they are unsure of the type of the biopsy procedure required or for more complicated and/or extensive lesions. Learn to see, learn to hear, learn to feel, learn to smell and know that by practice alone can you become experts. The practice of dentistry is essentially an art, standing on the easel of science. The initial diagnosis is based on the history and clinical features. The dentist should start looking at the various causative factors and the likely diagnostic possibilities- which again may require collection of more information and in-depth clinical examination of the patient. Sometimes when the clinical diagnosis does not seem to correlate with the etiological factors or the results of laboratory or radiological investigations, the pathology (biopsy report) provides the final diagnosis. Clinician should suspect a diagnosis… never expect it! 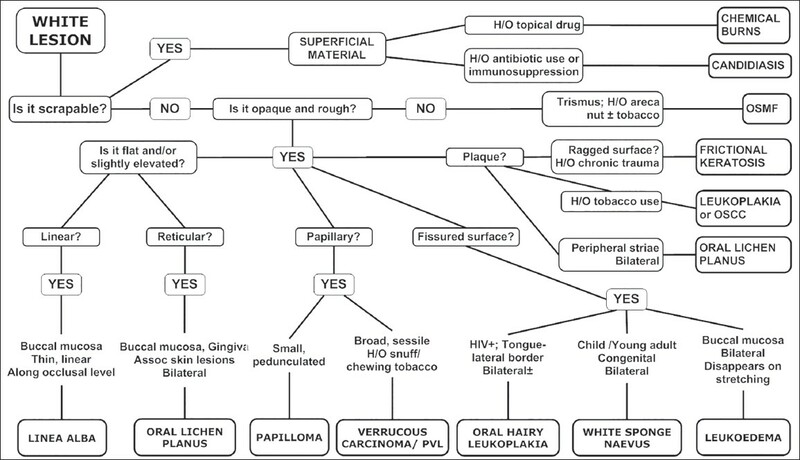 Izumo T. Oral premalignant lesions: From the pathological viewpoint. Int J Clin Oncol 2011;16:15-26. Fitzgerald RJ. Medication errors: The importance of an accurate drug history. Br J Clin Pharmacol 2009;67:671-5. Newsome P, Smales R, Yip K. Oral diagnosis and treatment planning: Part 1. Introduction. Br Dent J 2012;213:15-9. Kim S, Christopher L, Bancroft JD, editors. Bancroft's Theory and Practice of Histological Techniques. 7 th ed. Philadelphia, USA: Elsevier Health Sciences; 2013. p. 81. Sengupta S, Prabhat K, Gupta V, Vij H, Vij R, Sharma V. Artefacts produced by normal saline when used as a holding solution for biopsy tissues in transit. J Maxillofac Oral Surg 2014;13:148-51. Rosebush MS, Anderson KM, Rawal SY, Mincer HH, Rawal YB. The oral biopsy: Indications, techniques and special considerations. J Tenn Dent Assoc 2010;90:17-20. About the author Dr Subramanyam completed his BDS from Annamalai University (1986) and pursued his MDS (Oral Pathology & Microbiology), from Nair Hospital Dental College, University of Bombay (1990). He has a vast of teaching experience of 25 years. He is a recognized PhD Guide for Dr NTRUniversity of Health Sciences. He has more than 55 Invited orations - national and international and 15 [International and National] publications to his credit. He is Member, Editorial Board of Journal of Translational Medicine. He has been past-editor of Journal of IAOMP. He is a resource Person for "Training the Teachers" by Dr NTRUniversity of Health Sciences. He has an online portal Webmaster of Oral Pathology Online: http://www.oralpath.org.in/.